We were just going about our normal lives when a call came in from RCI: we had a week of time-share that was about to expire; wouldn't we like to use it somehow? Never ones to let something go to waste, we decided that it was time for another visit to Europe. But where could we get to on such short notice? France? Non. England? Nothing. Italy? Niente. Germany? Nichts. Spain? Nada. OK, where did you have something? Hmmm.... How about Austria? Where in Austria? Kaprun. I actually knew where that was: right in the heart of the Austrian Alps. So Kaprun it was. But that was just one week, hardly enough to make the flight from California worthwhile. How about a quick look at Provence while we were there? I called Club Med and booked four days at their resort in Opio, near Cannes, and we were all set. All set except that the bargain fares on the airline left one extra day that Club Med couldn't accommodate. A bit of time browsing the web and I was able to exchange a couple of e-mails with a lady who ran a bed and breakfast halfway between Avignon and Aix-en-Provence. Now we were all set,... or so we thought. The flights from San Francisco to Munich were uneventful except for the fact that when the seat ahead of me reclined, it pressed a metal bar into my kneecaps rather painfully. The stewardess got me into an aisle seat where I could get my knee into the aisle, away from the seatback. She then slammed into it every time she rolled a cart up or down the aisle. The passenger ahead of me told me I should have flown in business class. I keep forgetting how disagreeable transatlantic flights can be! 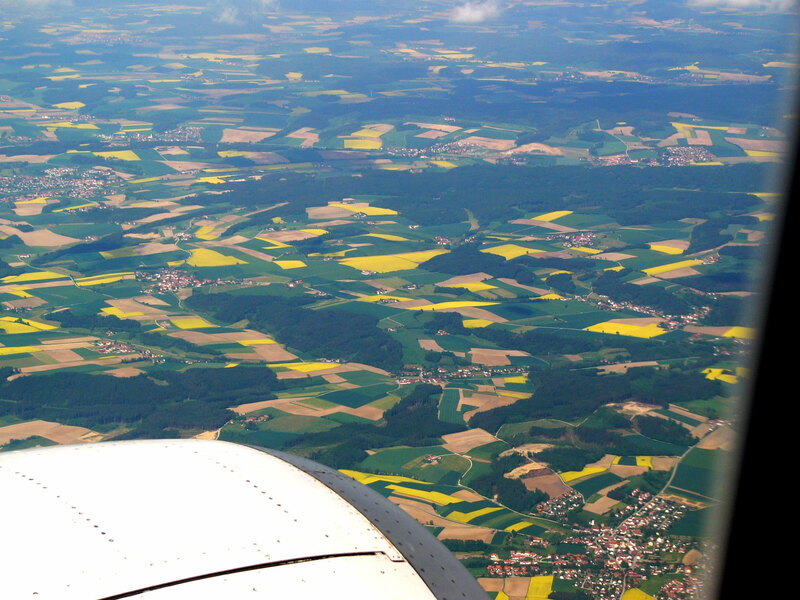 As we came into Munich, we saw a patchwork of woods and fields interspersed with villages that brought back fond memories of previous visits to Europe. After a bit of searching, we found the Marco Polo Club Hotel Happy, Our room was large and comfortable, our host was friendly and helpful, and the breakfasts were plentiful. A short walk down the road there were a couple of nice restaurants. It made an excellent base of operations for the week. The next day was Trinity Sunday, so we headed up to Salzburg to see what the music would be like in the Cathedral in Mozart's home town. Our host advised us to take the scenic route through Zell-am-Zee and Lofer rather than fight the traffic on the autobahn. He was right! Monday we headed up the Salzach valley to the Krimml falls. Tuesday, we decided to go back and check out the open air museum near Salzburg. Wednesday was warm and clear, so we rode the aerial tramway from Kaprun up to the glacier on the Kitzsteinhorn. Thursday we took a drive through the Kaisergebirge which we had glimpsed while driving down from Munich. 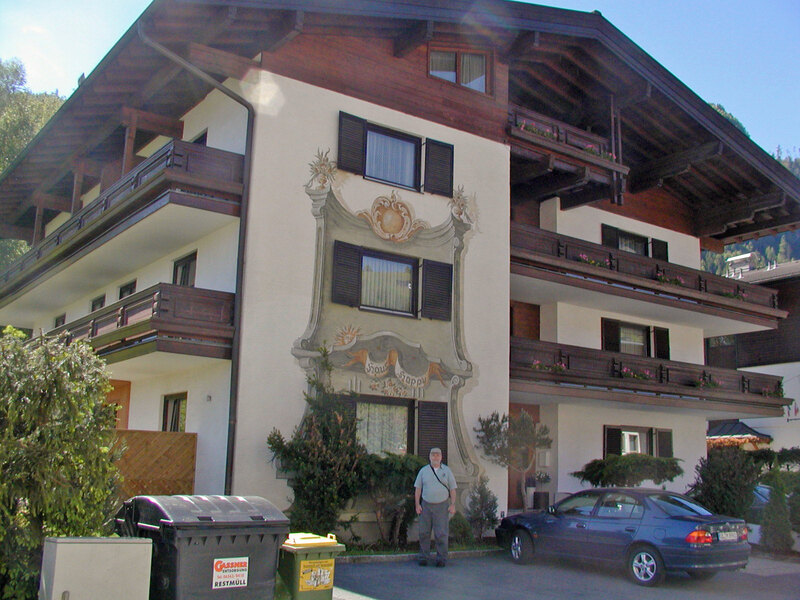 Friday we headed east, into the Dachstein mountain area and the village of Puergg. 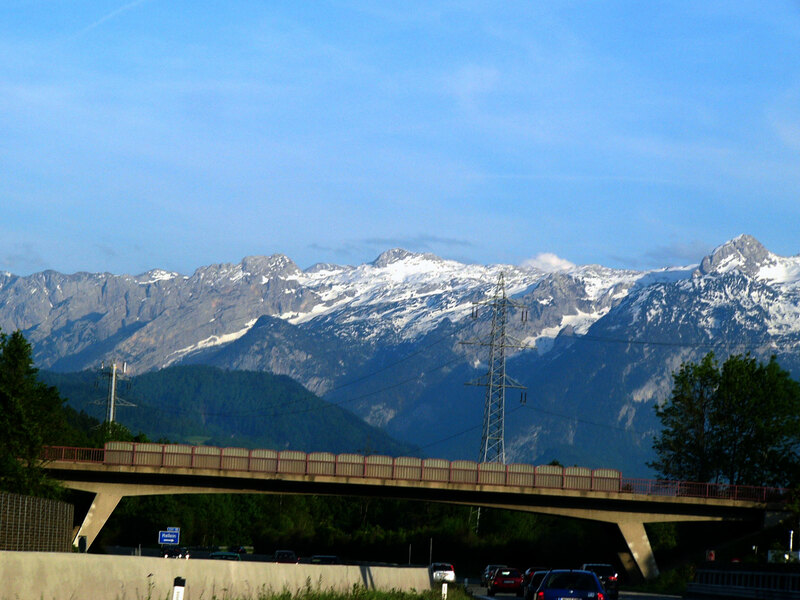 Finally, on Saturday, it was time to leave so we drove over the Grossglockner pass and down into Italy. Our next stop was at the southern end of the Alps, where they meet the Mediterranean. (c) Copyright 2005, F. W. Schneider, all rights reserved.